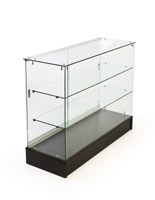 These counters & cash wraps that measure up to 48" wide are made of durable materials like laminated particle board and MDF, while using sturdy tempered glasses for shelving and full view exteriors. 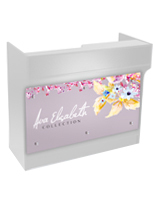 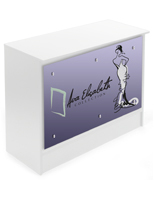 This makes the stands a great choice for any retail store, but they can also be brought to events or set up in offices to showcase other curios. 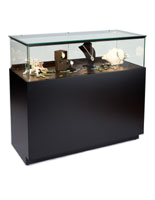 Each of the counters & cash wraps comes in a number of finishes for matching any environment, whether it's residential or commercial. 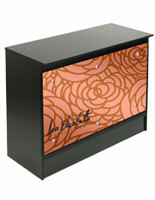 These include sleek black or silver and the more natural wood finishes like maple and cherry. Their design varies from model to model, meaning each one can be used in a different scenario. 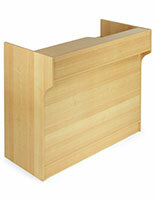 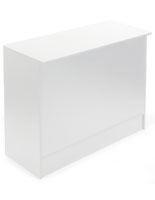 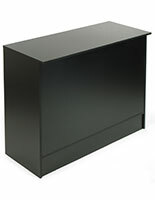 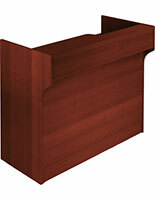 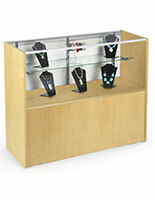 Included in this category are register stands with or without a ledgetop counter, display cases and corner units. 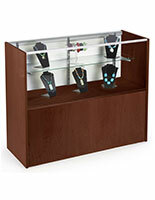 A single cabinet with lighting could fill a space on a store floor or multiple models could be purchased to create a full checkout area. 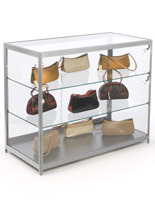 Full retail configurations with a matching finish and design are also available on this site. 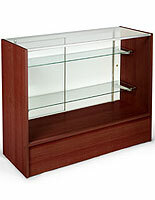 What special features do these counters & cash wraps come with? 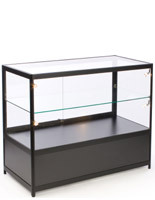 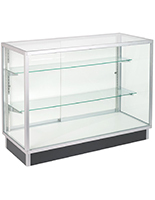 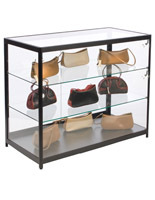 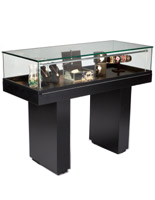 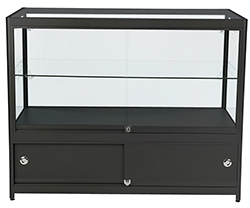 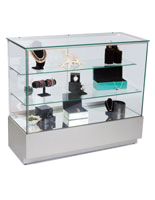 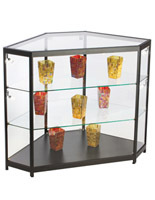 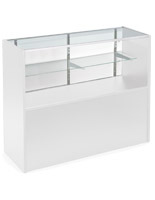 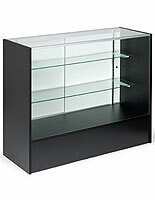 Many commercial display cabinets come with adjustable shelves for accommodating both small and large items. 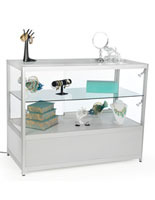 Some units also come with lighting for illuminating merchandise and curios. 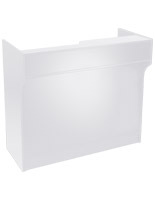 This illumination can be on the side or on the top of the fixture and use strong LEDs or halogen bulbs. 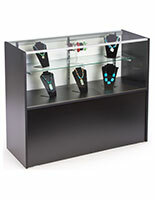 For users on a budget, display stands without lighting are also available. 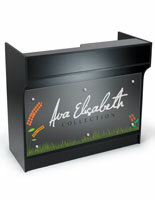 Another feature that some cases come with is the graphic panel that can show a pre-made image or custom artwork. 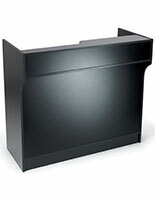 This affixes to the front of cash wraps with the included aluminum standoffs. 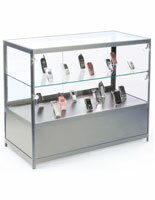 Many of these retail stands come with a locking function for extra security. 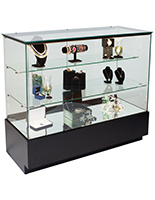 Lock-and-key cabinets are an ideal option for retail stores and other public areas where valuable merchandise and curios must need to be protected. 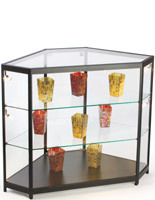 The fixtures' strong tempered glass is much stronger than normal glass, and if broken, forms small chunks instead of jagged shards that could cause injury. 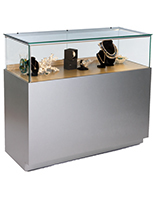 This shatter-resistant material is entirely clear to create a full view display. 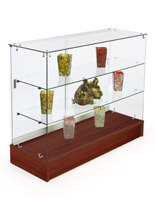 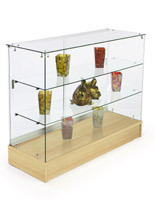 For wholesale pricing, purchase online at DisplayCabinets2go.com!